The most important preparation for being able to pull meals out of the cupboard quickly is to have a well-stocked pantry in the first place. The trend toward bigger grocery stores means one-stop shopping is more convenient; however, picking up a few necessary items at a large store can take longer than it did when stores were smaller. That means you need to be strategic about your shopping if you want to keep your pantry primed for fast meal preparation. 3. A no-effort occasional shopping trip for fresh items. I also like to keep a running list in a handy place so that when I head off to the store or to the shop online for groceries I don’t have to open every cupboard to do inventory. Although I often jot a few things on a scrap piece of paper, the most successful shopping trips are well-planned. At the test kitchen we have a printed form that we use to make shopping fast and efficient (that’s pantry manager Sabrina Falone’s desk pictured above). Even for personal shopping I still use headings such as produce, dairy, meat, frozen, grocery, etc. so that I can find my place easily on the list as I travel through the store. Do you have a shopping strategy you’d like to share? Cupcakes epitomize the food trends of personalization and portion control. In my last Topline Trends newsletter I wrote about how pull-apart “cupcake cakes” are trending up. These clusters of cupcakes, positioned in beguiling shapes, offer the visual impact of a whole cake but the serving ease of, well, cupcakes. To the other 20+ per cent all I have to say is check out an Eini Cupcake— and yes, gentle readers, they taste as good as they look! — and think about revising your (wrong) answer. While reading about how Canadians have become information snackers who use mobile technology to take in bite-size, easy-to-digest portions of information (think about the ticker that crawls along the bottom of the screen on news channels or the 60-second news breaks so many radio stations offer), I was reminded of the great joy provided by snack food. Whether it’s a mobile activity or the more conventional couch variety, snacking on little bits of food is actually compatible with snacking on information. Although there’s research that shows chronic snacking is linked to obesity, there’s also a body of evidence that suggests eating more frequent, smaller meals can be good for you. -The first step to having a fulfilling snack life is to define your snacking profile. –Step 2 is to buy the snacks. –Step 3 is the crucial step that will prevent snacking from having negative results: Divide snacks into appropriate servings so that you can grab them quickly and easily and so that you know when to stop. Pre-portioning snacks means that no matter how engrossing Grey’s Anatomy may be, you won’t unconsciously eat more than you should. -Candies such as Smarties, ju-jubes, etc. Which profile fits you and, tell me, what are you craving right now? Even when the pantry is empty, there are usually onions in most kitchens. And believe it or not, the humble onion — when caramelized — can come to dinner’s rescue. Caramelized onions are incredibly versatile. I always have a container ready and waiting for me in the freezer and the ingredients to make more are always on my shopping list. Saucy, soft slow-cooked onions can be added to mashed potatoes for a chef-style twist or used as a topper for a steak or a baked potato. One of my favourite uses for caramelized onions is as a topper for pizza (I make the one pictured above often). Likewise, pork chops sautéed with apples also love caramelized onions and adding them to a juicy grilled burger is blissful, indeed! -Toss sliced onions with melted butter in a heavy skillet set over medium-low heat. -Add a clove of minced garlic and a little dried or fresh thyme leaves. -Partially cover the pan and cook, stirring often, for about 20 minutes. -When the onions are very soft, remove the lid and increase the heat to medium. Brown slightly. -Sprinkle the onions with a little granulated sugar and sauté, stirring constantly, until well-browned and very soft. -Deglaze the pan (loosen the cooked-on brown bits) with a few tablespoons of dry sherry or chicken broth. -Stir in a splash of cider vinegar and season with salt and pepper to taste. Check out my recipe for Caramelized Onion and Mushroom Lasagna at homemakers.com. How do you use caramelized onions? I like lists. I find it reassuring to have things ordered and counted. My favorite, of course, is a Top 10 list but I’m not picky. I’ll take my Top lists in any number. Saveur Magazine is also a lover of numbered lists. In fact, every year for the last decade they’ve published a list of their editorial staff’s top food-related interests and topics. While my top 10 lists are always fast and easy to read, one of the fun things about the short form version of Saveur’s list is that they use cryptic descriptions and many vaguely familiar names. In this way they entice you ever deeper into the delicious depths of their website as you click and point your way to the full stories behind each numbered item. • Whey-fed pork: Move those acorns and tulip bulbs out of the swine pantry, this year’s top pigs will be eating this by-product of cheese making so that we can enjoy nutty flavored, velvet textured pork chops. • Crumbled cookies: Although Saveur’s editors specifically praise FEUILLETINE which are wafer cookie shards, cookie crumb coated cream puffs at NYC’s Beard Papa and other ‘crummy ideas’ gaining momentum in the sweet kitchen. • Natural licorice: Cutting edge chefs are using black licorice in not only desserts but in savoury slow cooked dishes such as short ribs and lamb stews, too. • Edible weeds: You could say that this trend is the result of slacker culture and the locavore movement colliding. Edible weeds (think dandelion, milk weed pods, etc) are a forager’s find and remind us that eating locally doesn’t mean finding a way to grow fig trees in Canada but looking closer at what is outside your own back door step. Have you noticed any of these things on menus or in the grocery store? When I was growing up I loved homemade butterscotch pudding. In fact, I vowed that as soon as I was an adult I would make an entire pot of butterscotch pudding and eat it all by myself. I still find that idea wonderfully appealing; however, as I mentioned on television recently, I’m also trying to stay slim and trim (BTW: I’ve lost four of the six pounds I talked about losing that day!). When I originally envisioned eating an entire batch of butterscotch pudding, it was a big batch. A really big batch. Enough for eight, in fact. While I know that my adult metabolism can definitely not handle that kind of indulgence, I do still love creamy, rich homemade butterscotch pudding. There’s just no substitute for scratch butterscotch pudding. The single-serve commercially prepared butterscotch puddings available in grocery stores don’t even taste like butterscotch. No, once you go homemade, there’s no turning back when it comes to butterscotch pudding! To satisfy my cravings and maintain portion control, I developed this smaller batch, microwave version of my favorite childhood dessert. Although it makes enough to share with a friend, you could eat the entire batch. You’d be blowing your diet for the day but you won’t have to lie down to recover! What’s your favorite childhood food? Are sweets more “cravable” than savoury foods for you? Blend the cornstarch with the sugar and salt until well combined in a microwave safe bowl or large glass-measuring cup. Whisk in about 1/4 of the milk until smooth. Blend in remaining milk, whisking until smooth. Cook mixture in the microwave on HIGH for 1 minute. Whisk well and cook for 2 minutes longer or until thickened. Spoon a little of the hot milk mixture into the eggs. Stir until smooth. Scrape the egg mixture into the hot milk mixture using a rubber spatula. Whisk well and cook for 1 minute longer on HIGH. Whisk in the butter and vanilla until smooth. Cool to room temperature. Makes 2 servings. 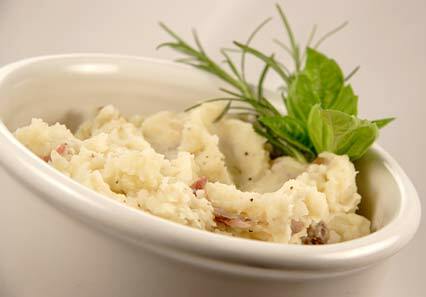 Mmmashed potatoes…It’s the year of the spud! The United Nations has designated 2008 the International Year of the Potato to raise awareness of the dietary importance of both this humble, well-loved tuber, and of agriculture in general. They’re promoting what my Irish ancestors have known for generations: that potatoes can be an easy-to-grow dietary staple. According to Statistics Canada, potatoes account for 35 per cent of all vegetables consumed. In 2002, the average Canadian ate 38 kg of potatoes in a variety of fresh and frozen forms including fries, baked, potato chips and mashed. Interestingly, although potatoes have received bad press due to their carbohydrate content, our consumption is up considerably from 33 kg per person in 1992. I often recommend serving potatoes as the perfect accompaniment for many of the meals in my latest book Dana’s Top Ten Table. Because our family is small, I find it simple to double up on my potato cooking so that I can prepare side dishes for more than one night. One of my favourite tactics is to boil a big batch of Yukon gold or new potatoes with the skin on. I serve half tossed with butter, sea salt and chives for dinner tonight. The next night, I either fork-mash the remaining potatoes and make an easy-to-prepare potato pancake (check out toptentable.com for a recipe for feta dill potato pancakes) or I cube the cold potatoes and pan-fry them in olive oil with fresh rosemary and red onions. Both preparations go with many main courses. Statistics reveal that more people over 55 years of age eat potatoes two to three times per week than younger people. How many nights a week do you serve potatoes? You are currently browsing the Dana McCauley's food blog blog archives for January, 2008.